Cassan Pulaski, MPH, DVM, the Merck Resident in Veterinary Parasitology, grew up in Mandeville, Louisiana, just outside New Orleans. She earned a B.S. in Biology and a B.A. in Psychology from the Sally McDonnell Barksdale Honors College at the University of Mississippi. She completed a concurrent MPH and DVM program at Louisiana State University in 2012 and 2013, respectively. Following graduation from veterinary school, she began a PhD program at LSU under the guidance of Dr. Jack Malone in the department of Pathobiological Sciences, and in January of 2015, she officially started her NCVP residency program in clinical veterinary parasitology. Cassan’s research focuses on macrocyclic lactone resistance in Dirofilaria immitis, including the epidemiology and transmission dynamics of canine heartworm disease in the Lower Mississippi Delta region. 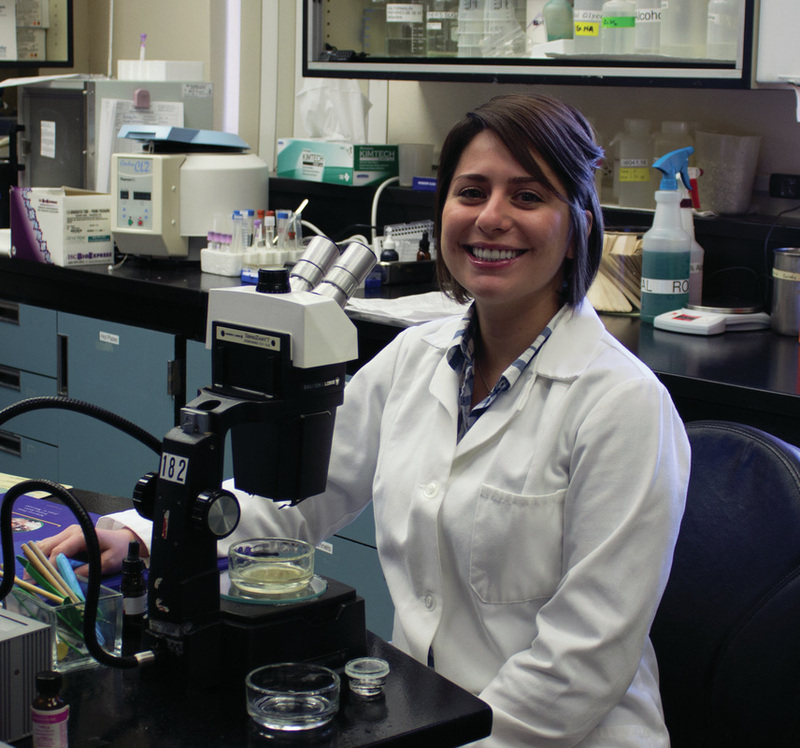 She currently assists with teaching of both the veterinary curriculum Year II parasitology course and the Year IV clinical rotation, as well as working in the parasitology section of the Louisiana Animal Disease Diagnostic Laboratory. Cassan spends her Saturdays employed as a relief veterinarian at a local small animal practice in Baton Rouge, and in her free time, she enjoys traveling and attending food and music events with her husband, Justin, and volunteering at vegetation planting events with non-profit groups aimed at restoring the Louisiana coastline. I grew up in Mandeville, Louisiana, a suburb of New Orleans on the Northshore of Lake Pontchartrain. I was very fortunate in that both my parents have an adventurous spirit and a love of travel, and they worked hard to make sure my siblings and I had a great deal of exposure to different cultures. My childhood was filled with international travel and foreign exchange programs, and those experiences provided me with the desire and confidence to study and participate in projects around the globe later in life, including in the Galapagos Islands and Suriname. Along with an enthusiastic nature and a love of blues music, I inherited a drive and work ethic from my father. His focus and determination have always inspired me to succeed; he’s a successful attorney with a Master’s in nuclear engineering. Although I value my academic achievements, I have always found a great deal of fulfillment in philanthropy. Some of the most defining experiences of my life have been when I’m volunteering, from visits to nursing homes in middle school, to candy striping as a teenager, to serving as president of an organization in undergrad that fed and managed the feral cat colony on campus, to spending the summer of 2011 washing and caring for birds affected by the Deepwater Horizon oil spill. I am also privileged to have a genuinely kind and selfless mother, who, along with a love and respect of animals, taught me at a young age of the joy that can come when serving others. My family and these experiences, combined with growing up in a place as unique and energetic as New Orleans, have truly made me into the person I am today. How did you initially became interested in veterinary medicine? ​Unlike many of my colleagues, I did not grow up wanting to be a veterinarian. Although I felt a natural connection with animals and had many rewarding experiences with them as a child, including bottle-feeding baby squirrels and training our family dog, at a young age, I had envisioned myself as more of a conservation biologist, trekking through the rainforest to find a new species of frog, than a medical professional. Even after 2 years of working part-time in college as a kennel attendant then veterinary assistant at a local clinic, I never thought I would go to vet school, and, admittedly, I felt this way because I really had no idea of the complexity and diversity within veterinary medicine. Then, during a graduate level Conservation Biology course I took the spring of my junior year of undergrad, I was exposed to the “One Health” concept, and it was as if the proverbial light bulb was suddenly switching to the “on” position in my mind. As I learned more about this seemingly obvious approach to health and medicine, I also began to recognize the role veterinarians could play. The following fall I decided to apply to vet school, and although at times I’ve questioned that decision, I know I made the right choice. I can vividly remember the first time I examined a blood smear from a microfilaremic dog and recognized just how amazing this parasite was. Dozens of seemingly large, dancing organisms in a single drop of blood, just hiding in plain sight from the immune system. I was hooked. The following fall I was enrolled in the Year II veterinary parasitology course, and I continued to be enamored by these complex pathogens and the intimate relationships they have evolved with their hosts. And after working with Dr. Malone and other researchers over the years, I was able to realize how many diverse opportunities were available for meaningful research in the field, and I knew I wanted to stay in parasitology. We are a lucky bunch! What focus have you chosen for your residency? Where will your research efforts be directed? ​My residency program will be focused on the epidemiology of macrocyclic lactone resistance in Dirofilaria immitis, with special attention on the spatial dynamics of the emergence and spread. The majority of my work will be centered in the Lower Mississippi River Delta area, although I plan to investigate macrocyclic lactone resistance cases nationwide.